The Second Annual Josephine Devlin Memorial Challenge between Young Finn Harps and The Legends/Crocks was recently held on Sunday 6th May 2012 at The Rope Walk, High Street, Newry and yet again it was a great day, afterwards there was entertainment and buffet in the Cavern Bar. Josephine was an ardent follower of the boys playing football and always attended the matches when she could. Josephine's brother Gerald Devlin organised the match, Gerald and the Devlin family would like to thank everyone who attended the match and everyone involved for their fantastic support. 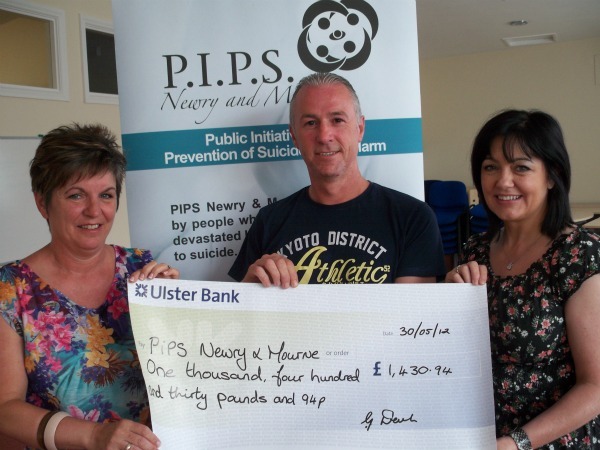 Photo below: Amount raised was £1,430.94 which was donated on behalf of the Devlin family by Gerald. PIPS Newry & Mourne would like to thank everyone involved in the organising, participation and support with a special thank you to Gerald and the Devlin Family.